Dave Anderson with authors and hikers Mike Dickerman and Steve Smith inthe Pemigewasset Wilderness Area. 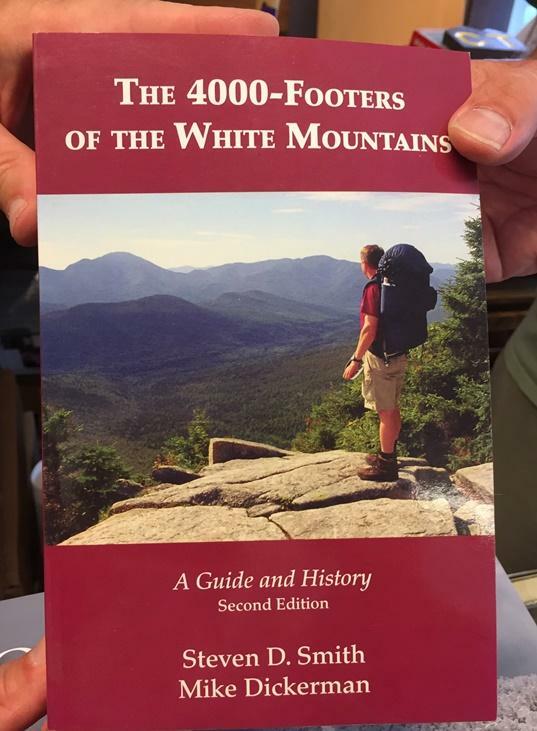 Dave learns a bit about how hiking the whites has changed over the years. The wooden bridge at the trail head is the gateway to 45,000 acres of protected land, in the heart of the White Mountain National Forest. As Smith points out, “Many a long journey has started here, and ended here.” We’re not far along our own journey when Smith and Dickerman begin swapping war stories from decades of walking these trails. Dickerman remembers breaking through the ice up to his waist; Smith remembers the difficulty of evacuating a member of one of his crew who had broken a leg on the trail. Dickerman and Smith literally wrote the book. Steve has seen a lot of those trail injuries, too, as a member of the regional search and rescue crew. And he reminded us of another tip to keep yourself safe on the trail. “I always leave an itinerary and a map with my wife. That’s a basic tenet of the Hike Safe program.” The program administered by NH Fish and Game also encourage hikers to keep safe by knowing your gear, and staying with your group as you make your way along the trail. Driving home that day I thought about how that intimacy and variety will always draw new hikers to the Whites. They don’t seem it, but these mountains are fragile. As Mike and Steve suggest, new hikers can become the best advocates for this mountain landscape. We sit down with Glenn Normandeau, Executive Director of New Hampshire Fish and Game (at left). We discuss recent headlines about his agency: from public boat launches to bears in downtown neighborhoods to a recent legislative study calling Fish and Game "woefully underfunded." The Forest Service announced Thursday it will remove the Thoreau Falls Bridge and not replace it. The bridge is located in the Pemigewasset Wilderness. It was built in 1962, two years before the Wilderness Act of 1964.